In this guide we will be dry aging the Ribeye using a UMAi Dry Aging bag kit and a vacuum sealer. The process is simple: wash the Ribeye thoroughly with cold water and pat it dry with paper towels. Once the meat is dry, place it in a dry aging bag. To keep the bag opening clean, roll it up like a sleeve before putting the meat inside. Meat residue might impact the quality of the seal, which you definitely don’t want. Once the ribeye is in the dry aging bag, it’s time to seal it. Depending on the size of your vacuum sealer, you might want to make two sideways seals to make the opening narrower to fit. If you have a FoodSaver-type channel sealer, use a VacMouse adapter strip while making the final seal. Make sure to push out any air bubbles while the air is being sucked out. Once done, let the bag sit for a few minutes to make sure there are no leaks. Place the ribeye in a fridge with good air circulation for 21-28 days. At the end of the process, the meat should be significantly darker and quite hard. Remove the bag, and cut off all of the tough crust that has formed on the outside- separate into individual steaks before removing the crust to make life easier. You should only have deep red, tender meat left. 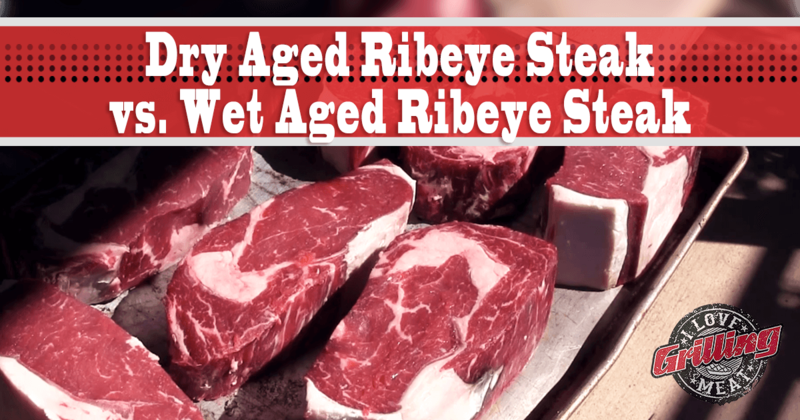 Now, the moment we’ve all been waiting for: Dry aged ribeye steak vs. Wet aged ribeye steak, facing off on the grill. Both steaks were hit with the same steak seasoning and reverse seared to medium doneness, then basted with butter and garlic. But how did they taste? Both steaks were very tasty. The dry aged ribeye had a more intense beefy flavor, and was surprisingly more tender than its wet aged counterpart. While it was a Choice ribeye, after dry aging it could easily compare to a Prime cut.